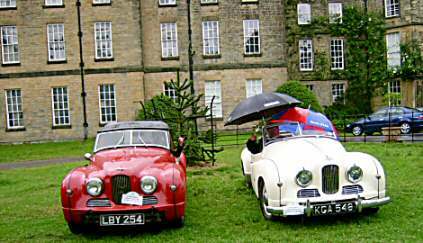 Two Jupiters were out in Derbyshire Sunday 20 June 2004. 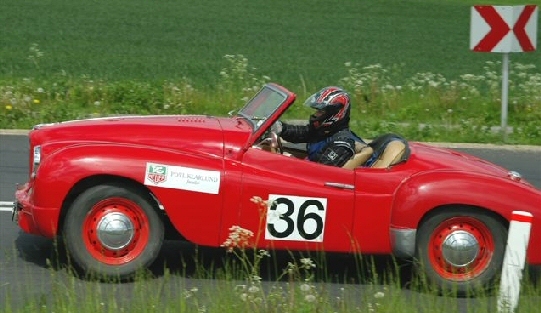 A Midsummer Charity Road Run. Frank and Christine Woolley (left) and Martyn and Paula King (right). 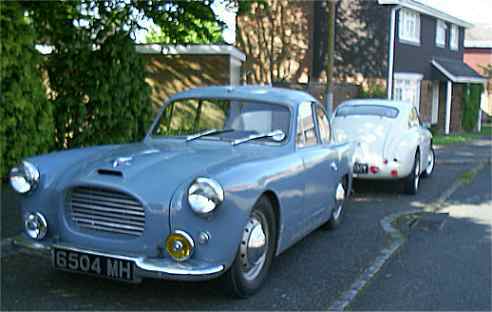 Some time early in 2003, Tim Wheater brought the Gomm saloon over to Ed Nankivell at Kymer Gardens. The Adams & Robinson saloon Jupiter is awoken from its slumbers to join in. Since this meeting, both Jupiters have been resprayed. 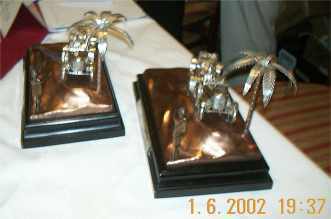 The silver "Wait & See" trophies on show at Norwich Jowett Car Club rally, 31 May-2 June 2002. 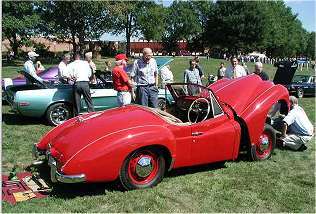 This Richard Mead bodied Jupiter had been in storage for far, far too long. 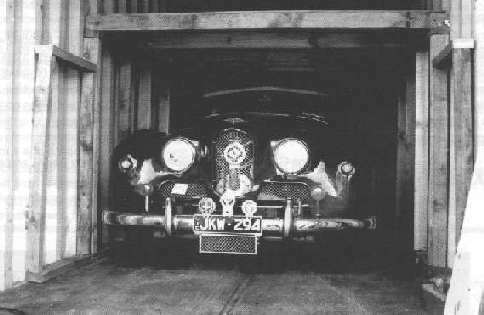 In storage for some decades, seen here with only swallow droppings and a spare back axle to keep it company, the car was restored in time (MOT two days before the off) for the 2003 Jupitour to the Loire Valley, during which it performed faultlessly. The Richard Mead Jupiter of John Powter as it was in July 2003 for the Jupitour to the Loire Valley. All ship-shape and Bristol fashion!! Fourth of July jollifications in California a few years ago. Jim Miller's car. 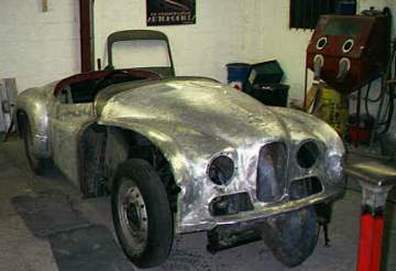 This Jupiter is as bought in 1999 prior to restoration in time for the Le Mans tour in June 2000. Previous owner had the car since 1955 and used it to 1972. Bodywork more or less done in this very thorough restoration. Mechanics now under way. 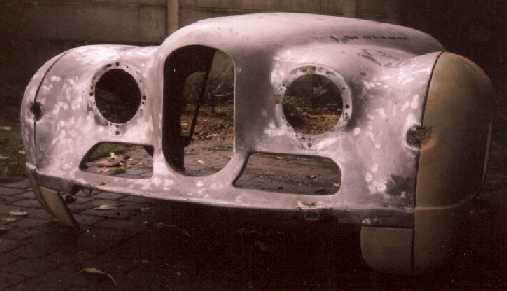 The front of the bonnet always needs a lot of careful and sensitive work due to the narrow sections. This Jupiter appears to have been carved almost entirely from wood! 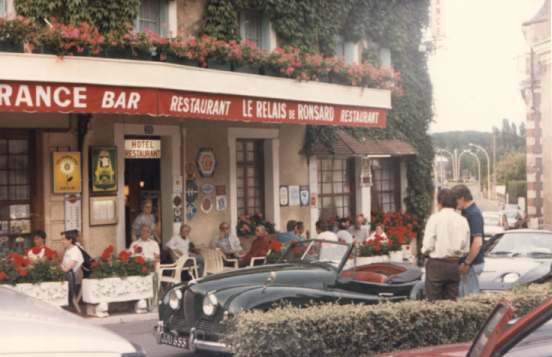 Here is a photo taken during the 1987 Pirelli tour to Le Mans, at a hostelry near the circuit. Dennis Sparrow (white shirt) is in the foreground. 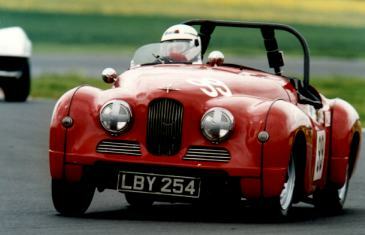 The green Jupiter was the first Jupiter to drive round the circuit since 1952. Now (June 2001) an R1 has actually RACED around that famous circuit! This is what Mike Allfrey's Jupiter looked like in its container on the way to the UK from Australia (Spring 2000). Normally it has to be steam cleaned on departure and arrival. The newly restored Jupiter of New Zealander Ray Win. 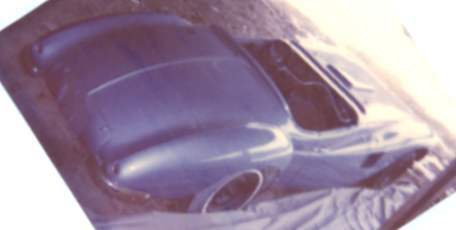 He purchased it fully dismantled and incomplete in November 1995. It had not run for many a long year, but it is now in excellent order visually and mechanically. 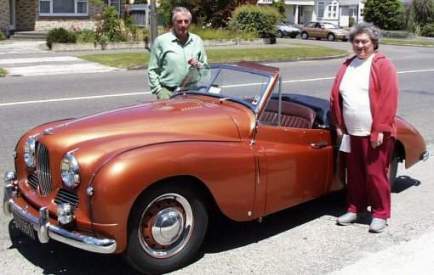 It took Ray and colleague Peter McKendry three years to rebuild the car, carrying out all the work themselves except chrome plating! 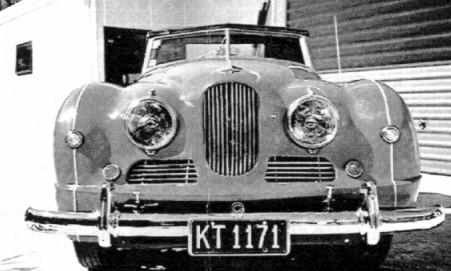 Picture and story from the Newsletter of the New Zealand Jowett Club. This shot is taken before the start of the 1951 RAC-TT International race at Dundrod, near Belfast in Northern Ireland. 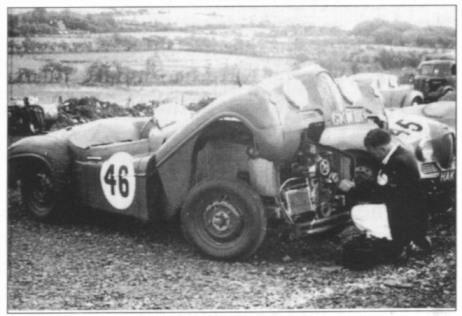 No 46 was the car driven by Tommy Wise to Class second - the same car (after a rebuild) that had won its class at Le Mans the year before. Behind can be seen the nose of HAK 366, the ultimate class winner driven by Bert Hadley. It was a difficult and demanding circuit, unforgiving in that it was bounded by hard banks, ditches, and stone walls. It required skill and judgment rather than the desire to drive fast. 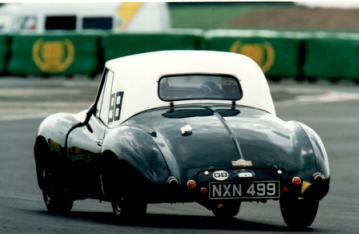 Frank Woolley racing at the small Yorkshire circuit of Croft, Spring 1999. Mike Smailes showing the view of his Jupiter he prefers other competitors to see - at the same race meeting at Croft. 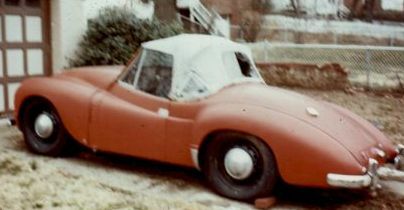 Jupiter as bought by Huntley Perry of Maryland, USA, in 1973. It then went into storage for a quarter of a century. 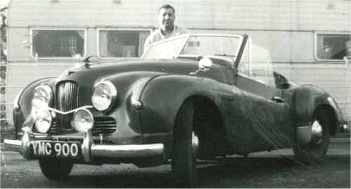 Huntley Perry was the first really distant Jupiter owner to commit to the Le Mans 50/2000 run. But first the Jupiter has to be restored. 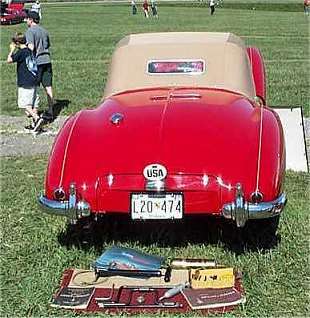 Treasured Motorcars of Reistertown, Maryland, took on the task which included taking the body off the chassis. Here partially reassembled, work on engine and suspension is in progress. 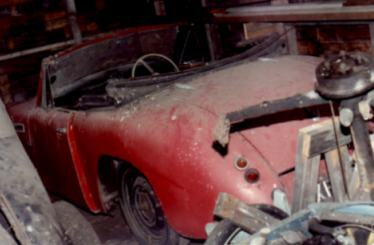 The Jupiter's neighbours in the workshop included an Abarth Double Bubble, a Cisitalia, and a Bandini. A Jupiter early in its life. 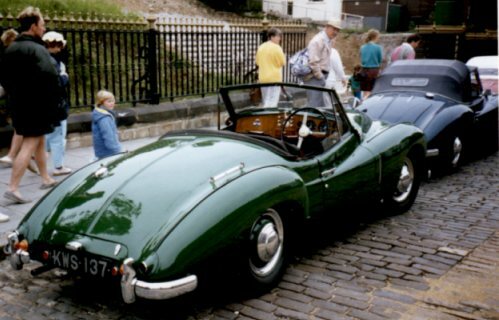 The badge bar was essential wear in the fifties, the hard top less common. 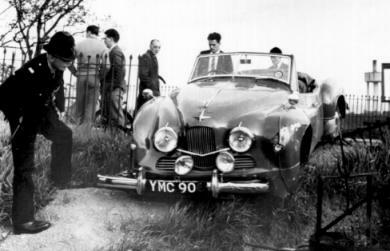 ...this is the car when owned by Lawrence Thomas which he bought AFTER the accident of 24 April 1960...in fact he bought it on January 17th 1961. Thanks to the wonder of the internet and E-mail, here is another shot of Lawrence Thomas (an inspector with the Gloster Aircraft Co) with his Jupiter. 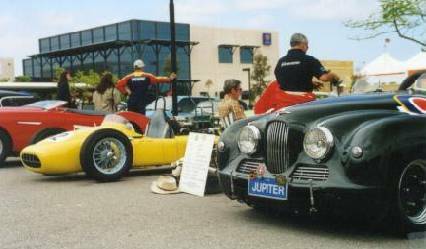 A nicely restored low mileage Mk1 Jupiter with a Mk1a Jupiter in front of it. Did you spot the other, red, Mk1a on the far right of the picture? 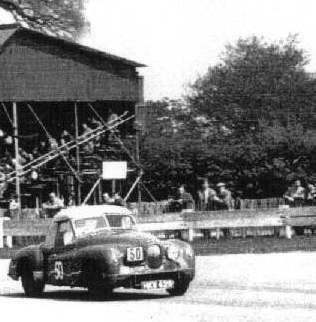 Robbie Mackenzie-Low racing in the class for 1500cc saloons at Goodwood on 2 May 1953. 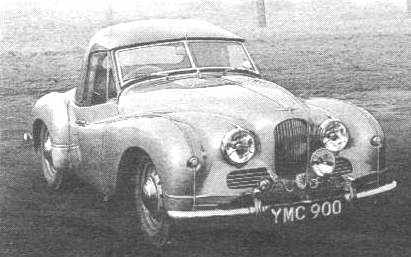 Hardtop was specially made by W M Park of Kew, London, in order to allow participation in saloon car events. 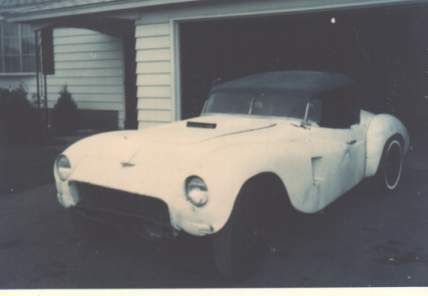 This car survives in running order although the whereabouts of the pink hardtop is uncertain. 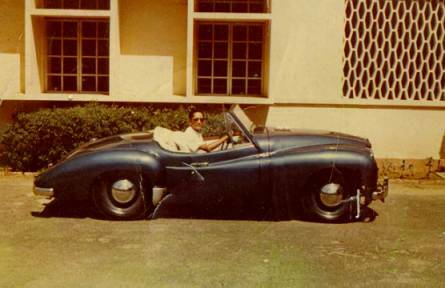 Dr Nileshwar took his Jupiter to India with him for a couple of years in the seventies. It is pictured here in Madras. He brought the Jupiter back to England and it is now restored and looking good as new. 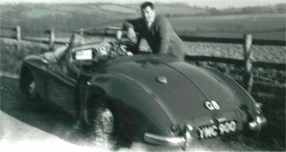 ...the supercharged Wylie-Javelin single-seater now owned by Joe Caudo. 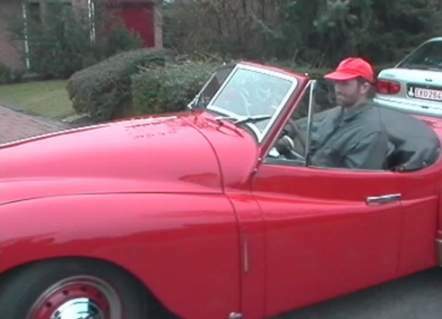 Jack Jacobs, of Peer, Belgium, poses with his multi-award-winning Jupiter (in both rally and concours events). He is working on another total-restoration Jupiter project. Naughty but nice...this mean-looking much modified Jupiter has an Olds V8 fitted. Where is the car now? Somewhere in the 'States - tell me, someone! I have now heard it is still in the New York area and looking for a new owner so contact me if you are interested. Here is another view of the much-modified beauty. 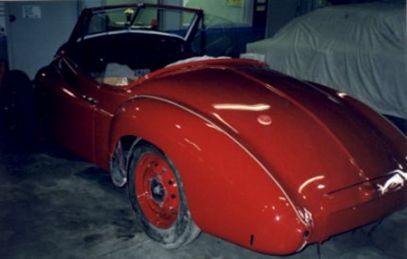 This is a later photo than the one above, with a respray to a lovely blue in progress Still no news from the US about this car - come on, someone! Another lost Jupiter. 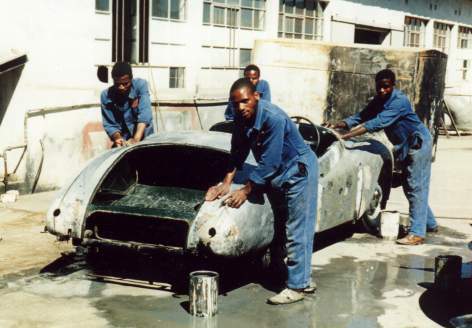 It was under restoration in Johannesburg, ZA, about 1980-ish. Here is the beautifully restored Jupiter of New Zealander Leo Bolter, with visiting Aussie Jupiter owners Mr and Mrs Maddocks. My Jupiter NNK 560 regains original shape in Julian Parker's panel shop. 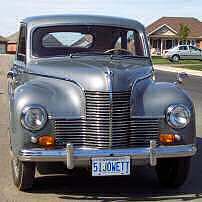 Unexplained bulge over the driver's side headlamp is smoothed out, after hours of skilled attention. The wing awaits more panel beating. This Jupiter belongs to Noel Stokoe, JCC and JOAC Press Officer. 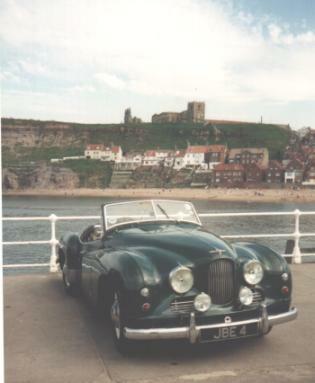 It is pictured here on the Whitby Promenade, June 1998. The Whitby in Yorkshire, where Captain Cook set sail from and Dracula arrived!!! Not the Whitby of the Synod of that name (held in 664 which saw off the Celtic church) apparently.